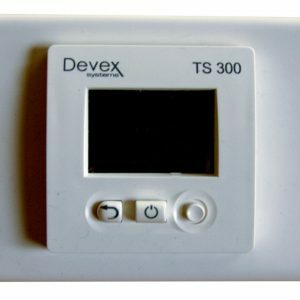 Electronic surface-mounted thermostat with setback mode. Switch to select comfort, setback or external timer. External timer to signal comfort or setback. The ability to regulate either the floor temperature, room temperature, or a combination of both. Electronic semi-recessed thermostat specially designed to control electric floor heating. Setback for night reduction (-4°C) via external timer. Can be mounted horizontally or vertically. 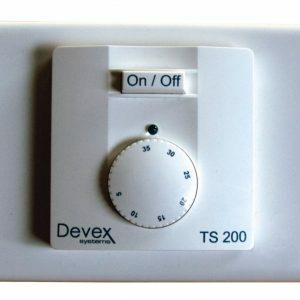 Programmable semi-recessed thermostat for controlling heating systems. 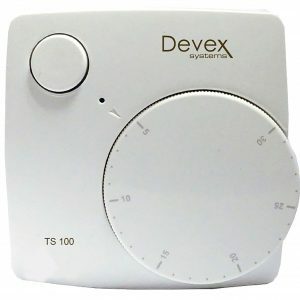 Customisable 7 day timer programmable down to the minute. Can be mounted vertically or horizontally. Copyright Devex Systems. All rights reserved.